Find out what's new at Happy Tails Dog Training and read newsletters. As of mid-August 2017, Happy Tails Dog Training will have its own place to call home – a dedicated indoor facility in the Whangarei town centre at 120 Roberts Street, Whangarei. This is fantastic news and I’m very excited – it’s been one of my goals for quite a while. The space is cosy but perfectly suited for my group classes. I prefer to keep numbers small so that everybody gets some individual attention. I will soon be able to offer classes and one-on-one sessions during the day as well as after hours. And, best of all, we’re no longer dependent on weather and ground conditions. I will be at the facility for classes and for my clients by prior arrangement. Puppy classes continue at Pet Essentials as usual until further notice. Work on progress at the new indoor facility - still quite a few jobs to do before we can open doors. Canine Fitness – Learn exercises to build your dog’s core fitness, flexibility, and muscle strength, teach your dog how to control movement, maintain your dog’s mobility, improve balance and build confidence. Great for most dogs, but especially sporting and working dogs, aging dogs, and dogs recovering from injury or surgery. My partner Christophe Pallies, who is a registered osteopath with over 17 years’ experience and a postgraduate diploma in Equine and Canine Osteopathy will run the classes together with me to provide a functional assessment of your dog and supervision of your dog's exercise programme. Tribball - This fun new sport replaces sheep with exercise balls to make herding accessible to any dog owner, anywhere! A good number of people attended the recent ‘Train Your Dog Like a Pro’ workshop – designed for people who have some basic experience and understanding of dog training and want to advance their training skills. Participants learnt about improving their mechanical training skills, behaviour principles, and developing and running effective training sessions. We also had some fun with a few short training games. A big ‘Thank-you’ to the two handlers with their demo dogs who allowed us to observe them putting the learning into practice. In April, I said good-bye to Bev Binney - my friend, dog training colleague, and Happy Tails Dog Training co-founder. 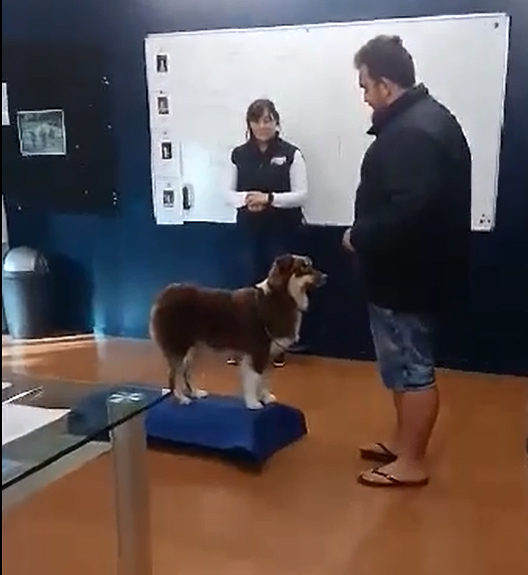 Bev left Whangarei to move to Taupo where she now operates Best Friends Dog Training. We started out in 2013 with the aim to promote force-free training methods and to make a difference so that fewer dogs are rehomed or left at shelters. I wish Bev all the best for her new exciting ventures and I know she’s now helping dogs and owners in the Taupo region.